Athanasius sets out his work on the incarnation in several thematic sections. He starts out talking about the state of humanity as God created it. He then moves on to talking about what happened as a result of the fall, and then about why and how God remedied this situation. He then moves on to apologetical arguments, defending the fact that God did make atonement in Christ against some sceptical objections. There is really a series of talks lurking in those subjects that could be put to very good use as an explanation of the Christian faith, but I’m going to pick out just one thread that runs through them: Jesus died for sinners. On the face of it, it sounds too simple. Why do I need to tell you this? Why, especially, do I need to quote the long-dead fourth century Bishop of Alexandria to tell you this? The reason is here: What people say has implications, whether they appreciate those implications or not. When a person says “Jesus died for me,” this confession of faith has consequences whether the confessor sees what those consequences are or not. I’m drawing on Athanasius here because he explained so much of the content of why Jesus came and what his death achieved that those consequences begin to appear on the horizon in a way that is appreciated by few contemporary evangelicals, Catholics or Orthodox. Athanasius gave Christianity – Catholic Christianity for that matter, very good theological reasons to doubt what so much of it affirmed – and still affirms – about human nature, the death of Jesus, and the consequences of sin. Athanasius begins his talk on the incarnation by talking about humanity, since it was humanity that God would become in the incarnation. He begins where humanity begins, in Genesis. Since in this talk my main interest in Athanasius is what his views imply about human destiny, my main interest in what he says about the creation of humanity is in what he says about human immortality or lack thereof. God made many creatures, including human beings. Compared to the other creatures, “Man,” Athanasius wrote, was “created above the rest, but incapable of independent perseverance” (from the heading of chapter 3). Athanasius explains that God gave mankind a gift, creating him in God’s image and “giving them a portion even of the power of His own Word; so that having as it were a kind of reflexion of the Word, and being made rational, they might be able to abide ever in blessedness, living the true life which belongs to the saints in paradise” (3:3). In Athanasius’ vocabulary, being perfectly human, as humanity was created, was to reflect the image of the true Word, that is, Jesus, who would be the perfect man. As long as humanity maintained the reflection of that perfection, they would live forever in blessedness, because God would continue to give them life. From time to time we hear theologians offering views on whether or not, before the fall, humanity is depicted in Scripture as immortal, with the potential to lose that immortality, or mortal, with the possibility of gaining immortality if they passed the test that God set before them. Rather than speaking about humanity as being either mortal or immortal, Athanasius presents humanity as being contingent or dependent on the reflection of the image of God. Notice – it is not that humanity’s immortality was contingent on maintaining this reflection (although this is true as a matter of consequence). Humanity itself is contingent on this fact. This becomes all the more clear when Athanasius moves on to talk about the fall of humanity, noting there that humanity does not merely lose immortality, but it loses humanity itself. Athanasius narrates for us the now familiar story of the fall of humanity. What exactly did God warn Adam about? “He brought them into His own garden, and gave them a law: so that, if they kept the grace and remained good, they might still keep the life in paradise without sorrow or pain or care besides having the promise of incorruption in heaven; but that if they transgressed and turned back, and became evil, they might know that they were incurring that corruption in death which was theirs by nature: no longer to live in paradise, but cast out of it from that time forth to die and to abide in death and in corruption” (3:4). But by ‘dying ye shall die,’ what else could be meant than not dying merely, but also abiding forever in the corruption of death” (3:5)? I’m fairly confident that from time to time you’ve heard pastors or theologians commenting on God’s sentence “you shall surely die.” In all likelihood, you will have heard people talking about what Adam did not drop dead on that very day, and the answer is often given that Adam entered into a state of spiritual death on that very day. For this reason, we are sometimes told, verses like Romans 3:23, “the wages of sin is death,” refer to something far more dreadful than mere dying, but rather to separation – and ultimately eternal separation – from God. For transgression of the commandment was turning them back to their natural state, so that just as they have had their being out of nothing, so also, as might be expected, they might look for corruption into nothing in the course of time. For if, out of a former normal state of non-existence, they were called into being by the Presence and loving-kindness of the Word, it followed naturally that when men were bereft of the knowledge of God and were turned back to what was not (for what is evil is not, but what is good is), they should, since they derive their being from God who IS, be everlastingly bereft even of being; in other words, that they should be disintegrated and abide in death and corruption (4:4-5). Whether Athanasius himself countenanced the thought of such a thing as “spiritual death.” He will have none of it here in his work of the incarnation. Athanasius closes the door to any such interpretation of his own comments about death. We have already seen his claim that when death came through sin, human beings began, not to enter a new state of perpetual accursedness and misery (although there is no doubt that the state into which humanity entered was accursed and miserable), but to actually “turn back” into their natural state, that is, to return to a former state. That state is a state of “what is not,” wherein people “disintegrate” and “abide in death and corruption.” They lose not merely happiness, or embodiment, but they become “bereft of being” itself. Let’s put it bluntly – they eventually cease to exist. There is a parallel between Athanasius’ argument here and his argument in the Incarnation. In the incarnation, he argues in effect that God is separate from creation, He is the source of creations vitality or movement, and that God surpasses creation in creative power. Therefore when creation – us – separates itself from God, it dies. When discussing the immortality of the soul, then, he treats the soul like God and the body like creation. He believed, of course, that the soul was part of creation. This should have given him pause, calling to mind his argument from the Incarnation, and holding back from his tenacious argument for the soul’s immortality. I have no interest in trying to solve the problem for Athanasius, or holding him up as a paradigm of consistency. If there is a lesson here, it is that we are on much surer footing when we spell out he bug obvious truths of the Gospel of Christ than we are when we are trying to defend a complicated framework of theology because it is what the Church teaches. Athanasius next turns to speak more directly about the Incarnation. But before doing so, he justifies his lengthy discussion of humanity and the fall. You are wondering, perhaps, for what possible reason, having proposed to speak of the Incarnation of the Word, we are at present treating of the origin of mankind. But this, too, properly belongs to the aim of our treatise. For in speaking of the appearance of the Saviour amongst us, we must needs speak also of the origin of men, that you may know that the reason of His coming down was because of us, and that our transgression203 called forth the loving-kindness of the Word, that the Lord should both make haste to help us and appear among men (1:1-2). The fall, says Athanasius, dishonours God. God’s character is impugned if he allows His workmanship to remain unredeemed. But in explaining why, Athanasius gets himself into more hot water with contemporary evangelicalism, and again, with himself. Man was perishing; the rational man made in God’s image was disappearing, and the handiwork of God was in process of dissolution. For death, as I said above, gained from that time forth a legal hold over us, and it was impossible to evade the law, since it had been laid down by God because of the transgression, and the result was in truth at once monstrous and unseemly. For it were monstrous, firstly, that God, having spoken, should prove false—that, when once He had ordained that man, if he transgressed the commandment, should die the death, after the transgression man should not die, but God’s word should be broken. For God would not be true, if, when He had said we should die, man died not. Again, it were unseemly that creatures once made rational, and having partaken of the Word, should go to ruin, and turn again toward non-existence by the way of corruption214. 5. For it were not worthy of God’s goodness that the things He had made should waste away, because of the deceit practised on men by the devil. Especially it was unseemly to the last degree that God’s handicraft among men should be done away, either because of their own carelessness, or because of the deceitfulness of evil spirits. What would have happened if God had not intervened in the Incarnation? Man would have perished. His creation at the hand of God would have been undone, God’s handiwork would be dissolved, and we would turn again into non-existence. It is as though Athanasius is trying to make it as obvious as possible what he thinks about human nature and death. How utterly queer his comments elsewhere on the immortality of the soul appear in light of this apparently unambiguous explanation! The Incarnation was God’s way of undoing this travesty. The Word, taught Athanasius, “became incarnate for our sakes, that He might offer Himself to the Father in our stead, and redeem us through His oblation and sacrifice” (Festal letter 10, par. 10). It is sometimes alleged that a penal substitution view of the atonement did not emerge until the time of the Reformation. I beg to differ. Perhaps the Reformation saw an explosion of interest in that idea because of its connection to the doctrine of justification by faith, but the thought is clearly here in Athanasius. Jesus took on the consequences of sin in my place. Here we come to a fork in the road, as it opens up other subjects that can be pursued. Athanasius was a champion of Christian orthodoxy, and of the doctrine of the Trinity in particular – a doctrine I wholeheartedly embrace. But what does it mean for Athanasius, as a devout Trinitarian, to say that sin causes the undoing of humanity in death, and the Jesus, the divine Son of God and second person of the Trinity, became man and suffered the consequences of sin? Was He too undone? Did the Trinity cease to exist when Jesus died, only to have the band reunite when Jesus rose? There is a myriad of issues here. My brief summary is that Jesus did not cease to exist, because He did not see corruption. This was of great importance to the evangelists on the day of Pentecost. He did not see decay, but remained in the tomb until God raised him. But even this is too much for Athanasius. He makes a way out of actually having to say that the Word disappeared or even died, by on the one hand talking about Christ submitting himself to death instead of all, which, for humans, meant an undoing of creation and a disappearance back into the nonexistence prior to creation, but on the other hand talking about Christ only taking to himself a human body (which was not coessential with the divine logos itself) and submitting that to death on behalf of all. He says this at times in the work on the Incarnation, and even more explicitly elsewhere, where he says that the body was not really part of Christ, but rather, Christ was taking and using a body. Athanasius, Letter 59, to Epectetus, par. 4, 8. In my view, this made Athanasius much too close to the Gnostics – who denied that Christ became flesh at all, since flesh is corrupt, and spirit is good. But that aside, what does this ad hoc manoeuvre do to Athanasius’ exposition of the incarnation and atonement? He had, in crystal clarity, spelt out that humanity had turned from the source of its very being, and so was returning to nothing again, and that Jesus stood in our place, taking the consequences of our sin in our stead. He became one of us to suffer and die as one of us. In the treatise on the incarnation, this is spelt out, from start to finish. It is biblical and consistent. But what now, when we add in this foreign piece of theology about Jesus merely taking a human body, allowing it to be nailed to the cross, while Jesus himself suffers none of the things described in the work on the incarnation? Jesus does not suffer the destruction that was coming to sinners in our place, but he watches on as a body does the work for him. The consequence is an unmitigated disaster for the atonement – the very purpose of the incarnation itself. On the face of it, a strong dualist might want to defend this view. After all, he might say, the consequences of sin is not the death of the soul – these never die, after all – but only of the body. Therefore Jesus only had to take a body and have it killed, and he has done the job. But the traditionalist who says this has not carefully read Athanasius’ work on the incarnation. The consequences of the fall are said to be – not a new state of bodily death while the soul lives, but rather a return to the destruction of humanity prior to the creation. Unless Athanasius wants to say that the soul of Adam enjoyed an eternal pre-incarnate life before creation, there just is no dualist reading of the work on the Incarnation. This is why it is vain to appeal to Ecclesiastes 12:7 as a proof text of dualism. “The body shall return to the dust as it was, and the spirit shall return to God who gave it.” As in Athanasius, the word is “return.” A reversal, an undoing, not a new mode of life altogether. Let’s say for a moment that what Athanasius says about the incarnation and atonement in his book on the Incarnation is correct. I’ll say that because I think it’s basically true. If it is, then there is only one conclusion we can draw about the consequences of not having one’s sin atoned for by the Incarnate Christ. Nobody has stood in our place. Nobody has reunited us to God, the source of life in whom we live and move and have our being, and nobody has drank the poison that was in our cup. All that Athanasius said about the fall – the reversal and undoing of creation, the dissolution of our being, and the sinking back into destruction, all of these will come to us without remedy. 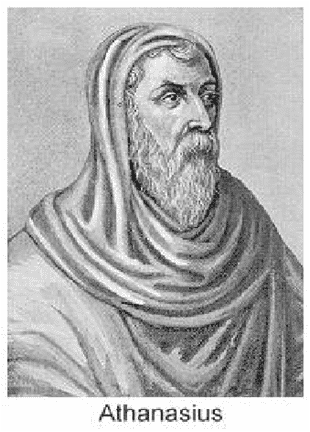 Athanasius did not believe in the final annihilation of the wicked. But he gave himself – and us – every reason to do so. A portrait once effaced must be restored from the original. Thus the Son of the Father came to seek, save, and regenerate. No other way was possible. Blinded himself, man could not see to heal. The witness of creation had failed to preserve him, and could not bring him back. The Word alone could do so. But how? Only by revealing Himself as Man.